On July 15, I turned 29. I normally do a Birthday Challenge on these occasions, of varying levels of involvement (click to read about years 24 and 26). 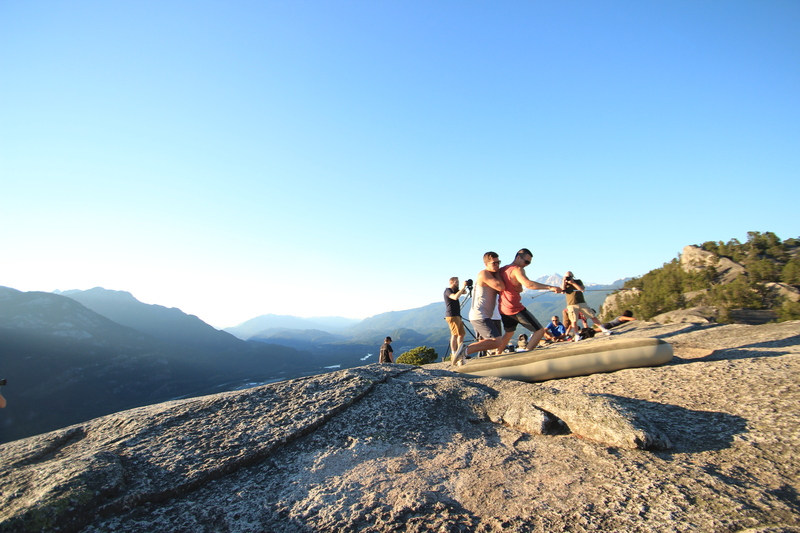 This year I wasn’t sure what Squamish would be like, and I procrastinated mightily in the planning. 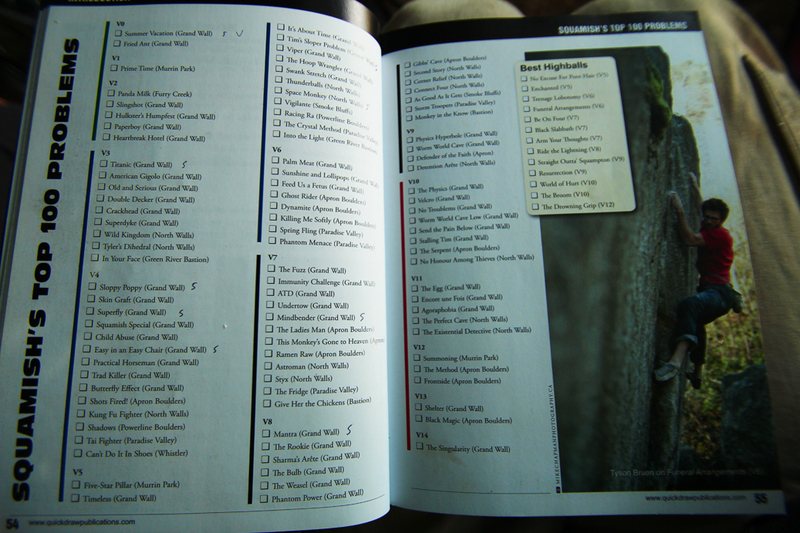 But after a few days enjoying the boulders in the magical forest, it seemed that nothing could be better than trying to do 29 of the “Top 100” boulder problems the guidebook has to offer. Full disclosure: apparently these are the “Top 100 plus”, meaning plus the best highballs. As a side challenge, or rather indulgence, I attempted to eat as many delicious cinnamon rolls as possible. For research purposes of course*. Chicken scratch, I know. The list included easier problems that require travel by car. I woke up around 7:15 and had coffee and a cinnamon roll from Zephyr Café. After sitting around long enough to feel caffeinated, I walked the arduous 4 minutes from our campsite to the Titanic boulder. I set up my camera and pad, and after a quick warm up, I did Titanic (V3), topping out at 8:55. The forest was quiet and empty, completely shaded by the Grand Wall. The sun wouldn’t hit this part of the forest for several hours, and I knew that Vikki was on her way shortly with more cinnamon rolls. That, and I had 28 brilliant boulder problems to climb. Life was good. Next was Timeless (V5), which felt good. It’s About Time (V5) felt awkward and hard, and was one of my least favorites of the day. I went over to Tim’s Sloper Problem (V5) and ran around the backside to do one last warmup, Slingshot (V2). Tim’s went down first go with the same tall man beta I used the first time I did it. Niko had just joined me, and we headed over to Fried Ant, a classic V0, climbing that just before 10AM. I was entering a dense cluster of Top 100s. American Gigolo (V3), Viper (V5), Old and Serious (V3), Skin Graft (V4), and Double Decker (V3) were all new problems for me, and I really enjoyed all of them, especially Old and Serious. Sloppy Poppy (V4) I had done before, but this time it felt significantly easier. Also, at this point I was being supported by Vikki, Gitta, Niko, Katie, John, Teresa, Dave, Joe and Sarah, as well as a shopping bag full of baked goods. I had more cinnamon rolls than I could eat and 12 great boulder problems down. Life was good. Next on the list was Hoop Wrangler (V5), which I was worried about since it was one of the steeper and more cryptic looking lines. I fumbled a bit on the slopers at the lip and fell back on my old friend, the desperation dyno. Thankfully I caught the jug, as getting there cost a bit of energy and I didn’t want to have to climb it again. Joe suggested The Rookie (V8), just around the corner on the same boulder. It seemed fun, straight forward enough, and uncostly in terms of time, skin, and body dollars, so I tried. After falling once on the jump-start, I stuck it and went to the top via excruciatingly slow mantel. A pleasant surprise, because it relieved some pressure on the other problems on the list. Almost halfway done at 11:40. A few more moderates with a fair bit of hiking in between, plus a slightly desperate ascent of ATD (V7), and I was back down at the Animal Magnetism boulder a little after 3pm. I managed a first go repeat of Mindbender (V7) for problem number 24, and moved on to the Easy Chair boulders to climb 4 more Top 100s. Superdyke (V3), the hardest of the lot by deed if not by grade was first, then Swank Stretch (V5), Practical Horseman (V4), and the ever-popular Easy in an Easy Chair (V4). I took an hour to do the four, relaxing and enjoying the cinnamon roll bounty that Vikki kept feeding me. I had saved the highball V0 Summer Vacation for number 29, but since I still felt in the zone of climbing well I dragged Niko, Katie, Teresa, and Vikki over to The Fuzz (V7), an awesome creekside boulder problem with very cool-looking holds. We put beers in the river and set up pads. I really wanted to flash it. The spans looked like they’d suit me perfectly, the holds were comfy and crisp to the touch, and the topout was cruisy. I think I used every hold, but got up the rig (are you reading this, Paul?) first try and scrambled back down for a celebration beer. It was getting late, and I still had to hike the Chief. Unsurprisingly, everyone bailed on that but Niko. and I don’t blame them. We huffed and puffed up many a stair to the summit, where we witnessed a bizarre film set involving a tripod, 12’ jib, air mattress, and a man tackling a blind person onto the aforementioned air mattress repeatedly while being filmed from different angles. They said they were in a church group. We didn’t ask followups. Not pictured: clapboard, and two very confused boulderers. Instead, we hustled back down to camp and over to the Howe Sound Brewery. The rest of the night was a blur of good friends old and new, some alcoholic drinks, an awesome pizza with brisket and bleu cheese, and more cinnamon rolls. My thanks go out to everyone involved. Thanks for the spots, the pads, the psyche, the love, and for being your awesome selves. This goes down as the most fun birthday challenge I’ve ever done, and having good people along for the ride gave it, if I may be cheesy, a deeper significance. Especially Vikki. She seriously came through with 6 different varieties of cinnamon roll, and invaluable camera assistance. Some of the criteria may seem mutually exclusive. This is not the case. The ultimate cinnamon roll is a perfect synergy of everything. There are no hard and fast rules about any of the categories individually. Rather, one must consider the whole and not the sum of parts. Gestalt rolls. Any advice regarding where to find good cinnamon rolls is welcome! Yes, yes you do! It is truly magical…I think you would find all sorts of inspiration here. Nice Spenser! 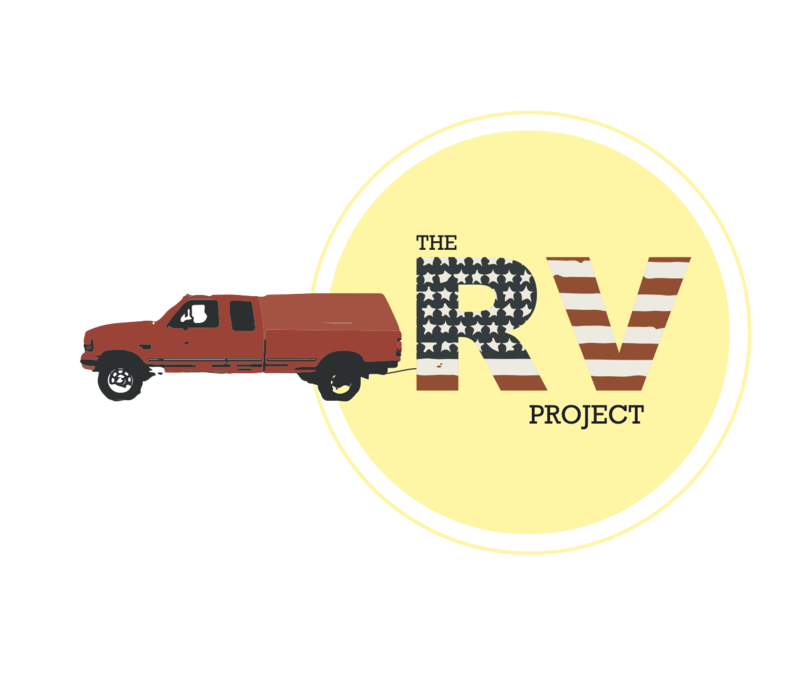 Glad to see RV Proj still going strong. Not sure if you made it to the Silver Grill in Fort Collins when you were here, but they have amazing cinnamon rolls. Vern’s in Laporte has a great cinnamon roll too! Never made it to either spot. I’ll have to check them out next time the RV Proj rolls through the front range. Thanks for reading! dooood.. you killed it! Happ Happ Happy mo’ fukna way lata brrrffffDAY!!! Thanks dude! Betta lata than neva. How you been? Are you still in the South?